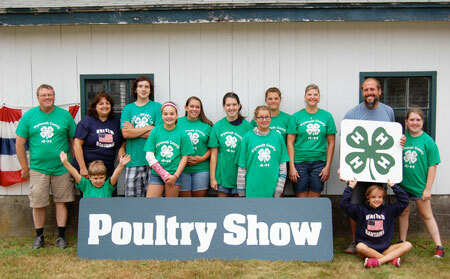 SOMETHING TO CROW ABOUT: Parent volunteers and members of the Hanson-based United Bantams 4-H Club stand behind their renovation work at the Marshfield Fairgrounds. “Someone will be available at all times to answer questions, holding chickens so children can touch and pet them,” Drake said. Parents are very involved in the club, which Drake noted is not a “drop-off club” and all parents of club members are CORI checked.